Welcome to the Miracle on Main Street! Something wonderful is about to happen in Downtown Lynchburg and we invite you to be a part of it. Welcome to a venue that echoes with the applause of hundreds of thousands of ticket holders over six decades. Its stage still holds the talents and tales of the countless touring performers that graced it, both the internationally famous (and infamous) headline stars and the road weary and poorly paid chorus girls of a bygone era. In the dark of the balconies, wings and backstage, whispers can still be heard of the stagehands, spotlight operators, wardrobe mistresses and projectionists that made this end of Main Street come alive six nights a week and sometimes twice on Saturdays. Today, local friends of a vintage age remember well her many extravaganzas. After performing in our modern Joy & Lynch Christian Warehouse Theatre, Grammy Award-winners tour the historic space and stare from her silent stage with awe and affection. Local students walk into a space unlike anything they’ve ever imagined, their eyes aglow. This gorgeous old theatre must be brought back to life. 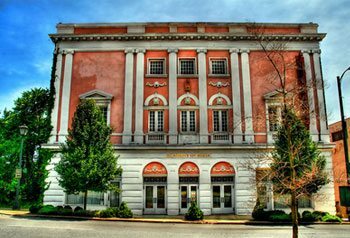 Welcome to the 1905 Academy of Music Theatre in Lynchburg, VA. A theatre bathed in silence since 1958. But not for much longer!